Vishnu is the Supreme God of Vaishnavism, one of the three main sects of Hinduism. Vishnu is also known as Narayana and Hari. The Vishnu Sahasranama declares Vishnu as Paramatman (supreme soul) and Parameshwara (supreme God). It describes Vishnu as the all-pervading essence of all beings, the master of—and beyond—the past, present and future, the creator and destroyer of all existences, one who supports, preserves, sustains and governs the universe and originates and develops all elements within. Though he is usually depicted as blue, some other depictions of Vishnu exist as green-bodied, and in the Kurma Purana he is described as colorless and with red eyes. In Hindu sacred texts, Vishnu is usually described as having the divine blue color of water-filled clouds and as having four arms. He is depicted as holding a padma (lotus flower) in the lower left hand, a unique type of mace used in warfare known as a Kaumodaki gada in the lower right hand, a Panchajanya shankha (conch) in the upper left hand and a discus weapon Sudarshana Chakra in the upper right hand. Vishnu is also described in the Bhagavad Gita as having a 'Universal Form' (Vishvaroopa or Viraata Purusha) Vishvarupa which is beyond the ordinary limits of human perception or imagination. Vishnu's eternal and supreme abode beyond the material universe is called Vaikuntha, which is also known as Paramdhama, the realm of eternal bliss and happiness and the final or highest place for liberated souls who have attained Moksha. Vaikuntha is situated beyond the material universe and hence, cannot be perceived or measured by material science or logic. Vishnu's other abode within the material universe is Ksheera Sagara (the ocean of milk), where he reclines and rests on Ananta Shesha, (the king of the serpent deities, commonly shown with thousand heads). In almost all Hindu denominations, Vishnu is either worshipped directly or in the form of his ten avatars, the most famous of whom are Rama and Krishna. The Puranabharati, an ancient text, describes these as the dashavatara, or the ten avatars of Vishnu. Among the ten described, nine have occurred in the past and one will take place in the future as Lord Kalki, at the end of Kali Yuga, (the fourth and final stage in the cycle of yugas that the world goes through). These incarnations take place in all Yugas in cosmic scales; the avatars and their stories show that gods are indeed unimaginable, unthinkable and inconceivable. The Bhagavad Gita mentions their purpose as being to rejuvenate Dharma, to vanquish those negative forces of evil that threaten dharma and also to display His divine nature in front of all souls. The Trimurti (three forms) is a concept in Hinduism "in which the cosmic functions of creation, maintenance, and destruction are personified by the forms of Brahma the creator, Vishnu the maintainer or preserver, and Shiva the destroyer or transformer. "These three deities have also been called "the Hindu triad" or the "Great Trinity", all having the same meaning of three in One. They are the different forms or manifestation of One person the Supreme Being or Narayana/Svayam Bhagavan. Vishnu is also venerated as Mukunda, which means God who is the giver of mukti or moksha (liberation from the cycle of rebirths) to his devotees or the worthy ones who deserve salvation from the material world. The traditional explanation of the name Vishnu involves the root viś, meaning "to settle" (cognate with Latin vicus, English -wich "village," Slavic: vas -ves), or also (in the Rigveda) "to enter into, to pervade," glossing the name as "the All-Pervading One".Yaska, an early commentator on the Vedas, in his Nirukta, (etymological interpretation), defines Vishnu as vishnu vishateh "one who enters everywhere". He also writes, yad vishito bhavati tad vishnurbhavati, "that which is free from fetters and bondages is Vishnu". Shruti is considered to be solely of divine origin. It is preserved as a whole, instead of verse by verse. 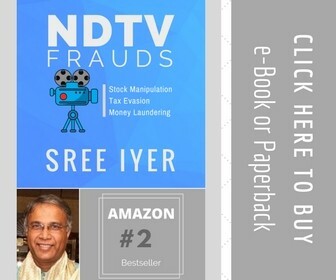 It includes the four Vedas (Rigveda, Yajurveda, Samaveda and Atharvaveda) the Brahmanas, the Aranyakas and the Upanishads with commentaries on them. Smṛti refers to all the knowledge derived and inculcated after Shruti had been received. Smrti is not 'divine' in origin, but was 'remembered' by later Rishis (sages by insight, who were the scribes) by transcendental means and passed down though their followers. It includes the Bhagavata Purana and the Vishnu Purana which are Sattva Puranas. These both declare Vishnu as Para Brahman Supreme Lord who creates unlimited universes and enters each one of them as Lord of Universe. The Vaishnava canon presents Vishnu as the supreme being, rather than another name for the Sun God, who also bore the name Suryanarayana and is considered only as a form of Vishnu. > In the Yajurveda, Taittiryia Aranyaka (10-13-1), Narayana sookta, Lord Narayana is mentioned as the supreme being. The first verse of Narayana Sookta mentions the words "paramam padam", which literally mean "highest post" and may be understood as the "supreme abode for all souls". This is also known as Paramdhama, Paramapadam, or Vaikuntha. Rigveda 1:22:20a also mentions the same "paramam padam". This special status is not given to any deity in the Vedas apart from Lord Vishnu/Narayana. > Narayana is one of the thousand names of Vishnu as mentioned in the Vishnu Sahasranama. It describes Vishnu as the All-Pervading essence of all beings, the master of—and beyond—the past, present and future, one who supports, sustains and governs the Universe and originates and develops all elements within. This illustrates the omnipresent characteristic of Vishnu. Vishnu governs the aspect of preservation and sustenance of the universe, so he is called "Preserver of the universe". > Vishnu is the Supreme God who takes manifest forms or avatars across various ages or periods to save humanity from evil beings, demons or Asuras, who became powerful after receiving boons from Brahma and Shiva. According to the extant Hindu texts and traditions, Lord Vishnu is considered to be resident in the direction of the "Makara Rashi" (the "Shravana Nakshatra"), which is about coincident with the Capricorn constellation. In some of the extant Puranas, and Vaishnava traditions, Vishnu's eye is considered to be situated at the infinitely distant Southern Celestial Pole. > Following the defeat of Indra and his displacement as the Lord of Heaven or Swarga, Vishnu takes his incarnations or avatars to Earth to save mankind, thus taking the place of the Supreme God, winning recognition by Shaivites and Smarthas. > In the Puranas, Indra frequently appears proud and haughty. These bad qualities are temporarily removed when Brahma and/or Shiva give boons to Asuras or Rakshasas such as Hiranyaksha, Hiranyakashyapu and Ravana, who are then able to defeat Indra in wars between Devas and Asuras. The received boons often made Asuras virtually indestructible. > Indra has no option but to seek help from Vishnu. Indra prays before Vishnu for protection and the Supreme Lord obliges him by taking avatars and generating himself on Earth in various forms, first as a water-dweller (Matsya, fish), then as an amphibious creature (Koorma avatar or Tortoise), then as a half-man-half-animal (Varaha the pig-faced, human-bodied Lord, and Narasimha the Lord with lion's face and claws and a human body). Later, Vishnu appears as human beings (Vamana the short-heighted person), Parashurama, Rama, Krishna, Balarama and finally as Kalki for performing his task of protecting his devotees from demons and anti-religious entities. > For example, Ravana is the greatest of Shiva's devotees, but is slain by Vishnu, who appears before him as Lord Rama, the son of Dasharatha. > Vishnu's supremacy is attested by his victories over those very powerful entities who are themselves devotees of other Gods such as Brahma or Shiva. It is further attested by the accepted iconography and sculptures of Vishnu in reclining position as producing Brahma emerging from his navel. Brahma the creator is thus created in turn by Vishnu out of his own person. Instead Vishnu takes various avatars to slay or defeat those demons. But it is to be noted that Vishnu also provided boons to Akrurasura, a bear faced demon who was destroyed by Lord Shiva. > Vishnu's actions lowered Indra's ranking among Hindu deities and led to the ascendancy of Vishnu. Few temples are dedicated to the Sun or Suryanarayana, nor indeed Indra, nor does Indra figure largely in the Hindu religion. > Indra is almost completely absent from the deities considered as the chief or most important deity. 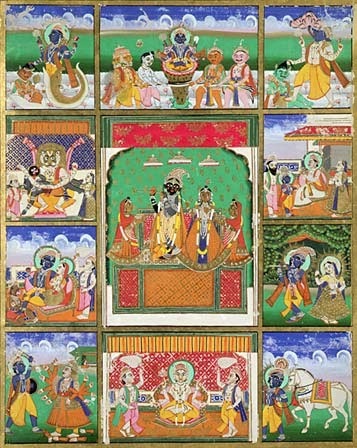 Ten avatars of Vishnu (Matsya, Kurma, Varaha, Vamana, Krishna, Kalki, Balaram, Parshurama, Rama and Narasimha). Matsya: the fish that kills Damanaka to save the vedas and also saves Manu from a great flood that submerges the entire Earth. Kurma: the turtle that helps the Devas and Asuras churn the ocean for the nectar of immortality. Varaha: the boar that rescues the Earth and kills Hiranyaksha. Narasimha: the half-lion half human, who defeats the demon Hiranyakashapu. Vamana: the dwarf that grows into a giant to save the world from King Bali. Parashurama: "Rama of the battle axe", a sage who appeared in the Treta Yuga. He killed Kartavirya Arjuna's army and clan and then killed all the ksatriyas 21 times. Rama: the prince and king of Ayodhya who killed Demon King Raavan. Krishna: the eighth avatar of Vishnu. Together with his brother Balarama an avatar of Shesha his dearest servant. Vishishtadvaita proponents consider Balarama is the ninth avatar of Vishnu. According to some, Buddha is the ninth avatar of Vishnu. Prince of wisdom from Kapilavastu. Kalki: the tenth Avatar of Vishnu and said to be the harbinger of the end Kali Yuga. Some versions of the above list include Hayagreeva among the Dashavataras while some include Buddha as ninth avatar of Vishnu. Etymologically speaking, the word 'Visnu' means 'one who pervades, one who has entered into everything.' So he is the transcendent as well the immanent reality of the universe. He is the inner cause and power by which things exist. (b) One who is the abode of all human beings. (d) One who is the final goal of all human beings. 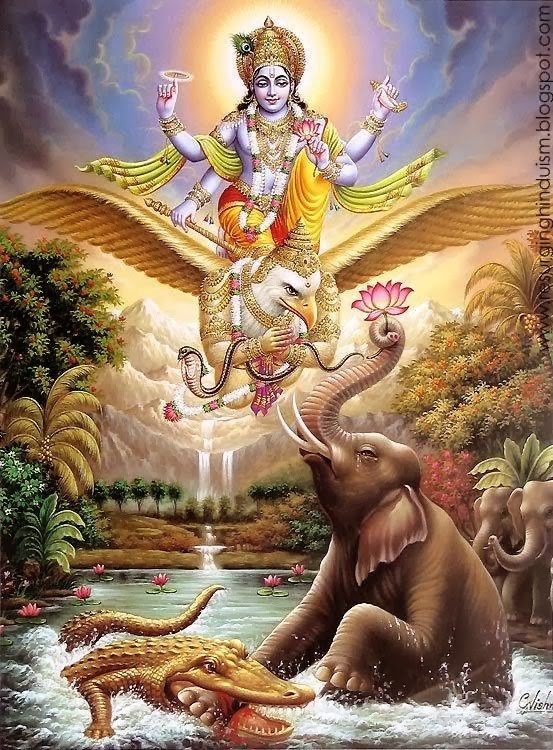 > After the destruction of the universe of the previous cycle and before the creation of the next, Narayana, the Supreme God, falls asleep on his bed of the great serpent Sesa (also called Ananta), which is floating on the waters of the ocean Ksirasamudra ('ocean of milk ). One of his legs is resting on the lap of his consort LaksmI, who is gently pressing it. When he is dreaming as it were, of the next creation, a lotus springs forth from his navel along with god Brahma seated on it. After waking tip, he instructs Brahma to proceed with the act of creation. > This is a highly allegorical picture. The ocean represents causal waters from which all life springs a concept not uncommonly found in other religions also. Or, since it is Ksirasamudra, the ocean of milk, it stands for the purest form of Prakrti or nature in its undifferentiated state, whiteness' indicating this purity. Out of the several equivalents of the word Apas (water), is the word Amrta (nectar, signifying bliss also). Hence we can say that the Lord Narayana is floating on the ocean of bliss, which is as it should be. > The serpent Sesa or Ananta is said to have a thousand heads and is supporting the worlds on its hoods. Ananta, which literally means the 'endless' or 'infinite' actually stands for cosmic time which is infinite or endless. Created worlds come into being in time and are sustained in time. This is the meaning of the thousand hoods supporting the worlds. The thousand hoods, simply indicate the innumerable divisions of time. > The concept of the thousand hoods supporting the worlds can also lead to the interpretation that the serpent represents the cosmic space, in which everything exists. > The word Sesa is also significant. It actually means 'the remainder', 'what is left over at the end'. Since creation cannot proceed out of nothing, it is to be assumed that 'something' is 'left over' (sesa) from the previous creation, which forms the seed as it were, for the next. So, Sesa represents the totality of the Jivas or individual souls in their subtle form, left over from the previous cycle and needing more opportunities for regeneration. > Serpent can also represent Kama or desire which is always left over (sesa), even after acquisition and enjoyment of the desired object. This goes on until Moksa or final liberation. Hence, in a cosmic sense, it can stand for the desire of the Lord to proceed with the next cycle of creation after rest! > Visnu is always described as Nilameghasyama, of a dark blue hue like that of the rain-bearing cloud. Since the infinite empty space appears as deep blue in colour, it is but proper that Visnu the all-pervading cosmic power, be depicted as blue in colour. > The commonest form of the Visnu icon has one face, four arms holding Sahkha (conch), Cakra (discus), Gada (mace), Padma (lotus) and wears a necklace with the famous gem Kaustubha dangling on the lock of hair Srivatsa, on the left chest. He is also wearing a garland (of gems, or fragrant flowers) Vaijayanti by name. > The four arms represents the four quaters, hence, absolute power of the Lord in all directions. 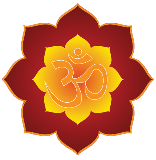 The Sahkha represents the five elements like the earth, water etc., Cakra stands for the cosmic mind, Gada indicates the cosmic intellect and the Padma points to the evolving world. Just as the lotus is born out of water and unfolds gradually in all its glory, this world also is born out of the causal waters and evolves gradually in all its splendour. Hence the lotus stands for the evolved world. This world can be created only by a combination of the five elements, the mind and the intellect. Hence the total meaning of this symbology would be that the Lord Visnu is the creator and master of this world. > The curl of hair, Srivatsa, represents all objects of enjoyment, the products of nature. The gem Kaustubha, resting on it, stands for the enjoyer. So, this world of duality consisting of the enjoyer and the enjoyed, is like an ornament for the Lord. The garland Vaijayanti is symbolical of the subtle elements (bhnta-tanmatras). Sometimes two more weapons, Nandaka the sword (representing wisdom) and Sarilga the bow (representing the cosmic senses) are added to the arsenal of Lord Visnu. The true Vaishnaav, the devotee of Vishnu, is the one with whom God is thoroughly pleased. He dwells apart from Maya. Performing good deeds, he does not seek rewards. Spotlessly pure is the religion of such a Vaishnaav; he has no desire for the fruits of his labors. He is absorbed in devotional worship and the singing of Kirtan, the songs of the Lords Glory. Within his mind and body, he meditates in remembrance on the Lord of the Universe. He is kind to all creatures. He holds fast to the Naam, and inspires others to chant it. O Nanak, such a Vaishnaav obtains the supreme status. Read More Articals Of "Lord Vishnu"